Fourth in the “Fish Stories” Series. Purchased: At the Hayward Bookshop on Bog Street for $1.25. Bernard was looking for a misadventure because a real, good adventure seemed too rosy and sunny for his disposition that day. His face was the color of an old worn dishtowel and Larky told him if he didn’t leave the house at once and get some good industrial air, she would roll him up in the old Turkoman and send him off on a steamer to the South. So, he trod down to Bog street, a name he particularly admired as he often felt the dregs of humanity waded frequently there and he felt inclined to get very damp that day in the apathy of all of them. He loitered at the grocer and prodded at fruit with his sinewy, chalky fingers and then stepped into Hayward’s. He felt jolly at once when he had found a bright green volume, named “Flat Farming” which gave advice on growing crops on your terrace. How Larky would disapprove, he thought and snatched it up. A few spines down, he saw, “Barnum” and smiled a little woeful smile like that of a sickly child receiving an update on his disease. 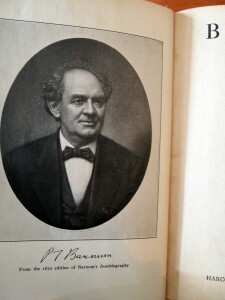 “Barnum”, the autobiography of the famous circus proprietor. Circuses had always bored him, spectacles in general seemed obscene and self glorifying and most of all freaks made him feel odd and somewhat clammy. Larky claimed it was because of the large lump on the top of his head and when he saw the freaks, he possibly felt an affinity with these strange souls. The lump itself was barely noticeable and he covered it well with his woolly head of hair but on occasion, the hair would part and the lump would protrude and friends would comment. “My god, Bernard, what on earth happened to you?” Bernard would reach up to his head and pat it and push it down as if attempting to calm an animal and claim he had taken a bad fall the week before. He had the lump since childhood and the doctors merely said a portion of his skull had simply grown up and out like a craggy little island suddenly sprouting from a sea. It was harmless, they said. Was it harmless? He wasn’t sure, it felt spongy and terrible under his touch like a moss garden one stumbles upon in the dark. 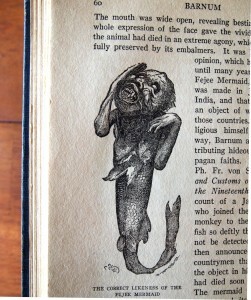 He leafed through the book and spotted Tom Thumb. What was so interesting about that little man and why had Barnum made him a general? It didn’t seem fair really. Why did he not have a title? Whereas a portion of him had grown out, poor Tom’s body seemed to implode into itself and never grow. Larky had once dragged him to the circus and they had seen the freaks but no midgets. The fat lady interested him to a great extent and he admired her from afar as if she was a large sculpture one didn’t understand. She seemed so jolly for a fat lady and every so often she would reach down within her clothing and pull out various props. A large pair of pantaloons. A shoe the size of a cat. A golden comb that she combed through her thick and lovely hair. He got closer and noticed she was sweating quite profusely and pockets of sweat gathered in vestibules between rolls of her fat. Her sweat seemed to have no odor and when he walked up to her to say hello, she said, “charmed to meet you.” with a lovely high pitched voice, like a squeaky nightingale flying out slowly from her stately lips. He bought the book at once and decided perhaps if he did leave Larky, the circus might accept him and give him a grand title as Tom thumb. Perhaps his could be, Bernard of the Lump, The Lumped Man or something to that effect. Penned: 1921, mostly on trains as Werner was an avid traveler and found most of his material while riding on trains, carriages or trams. Martin Werner knew little of London’s street food but he knew plenty of the fare found on most trains. The roasts were always perfectly roasted and the Cognac flowed freely. He found conversations on trains most agreeable because people were always jolly as people often are while traveling. For if one is going somewhere, it was always away from where they were, which had to be disagreeble in the first place as they seemed inclined to leave it. And yes, he could always spot a salesman, asleep and dissolute in the corner, waving about his cigarette and kicking the edge of his wares case. Those types hated travel the most and he avoided them lke the plague. He wasn’t sure why he had chosen to write about Barnum, perhaps because he was a fellow traveler, another ambulatory fellow. And like Barnum, Werner saw money everywhere he went, in the hair of widows and the chubby fingers of pampered children. But perhaps he wrote about Barnum because of Jenny Lind. 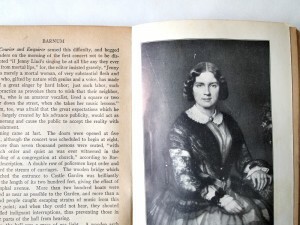 Jenny Lind was the famous Swedish opera singer Barnum invited to America to perform shows. Werner suspected the little midget Tom Thumb had an affair with Lind. He was also sure Lind never returned to Sweden but became quite fat and lost her voice. He believed Barnum made her the fat lady for rumors of the fat lady at his circus spread about like wildfire for enormous as she was, she had the voice of angel whenever she spoke. Later Jenny Lind was to have turned up in Europe once more but her appearance had altered. She was thin but heavy bags of skin fell from her neck and arms and she waddled about. The public refused to listen to her and claimed she was a fraud. Werner noticed his own wife had begun to gain weight as well and travel seemed the best solution. It also allowed him to have great dalliances in the sleeping compartments of certain young women who were traveling fro the summer to an aunt’s for lessons of society or other such nonsense. They all seemed to learn so much more from his lessons. Often he imagined the small Thumb riding atop the obese Lind. What a strange sight he thought and wondered if the European mind was more modern perhaps this itself could be an exhibit. 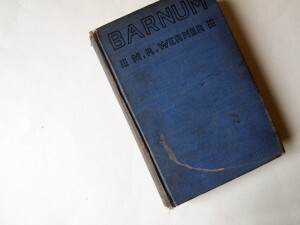 After the book came out Barnum almost sued him for Slander and Werner was forced to write a disclaimer after the fact. Later on in life he was seen riding in large, spacious town cars, a portly, sour fellow blinded by his ambitions.